This eclectic "meeting place and cafe" in Brunswick serves breakfast, lunch, and dinner. The shop is loated in a restored church in downtown Brunswick. Amenities include a library of antique and classic novels, local books on history, and a children's corner. Wi-Fi is available in the choir loft. 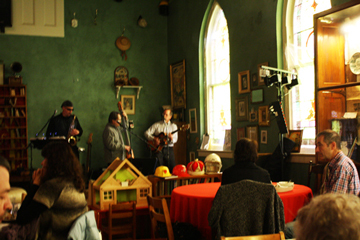 The cafe features local musicians and has an expansive "Jazz Brunch" on Sundays. The original structure was built in 1910 as the Brunswick Reformed Church, but closed in 1968.